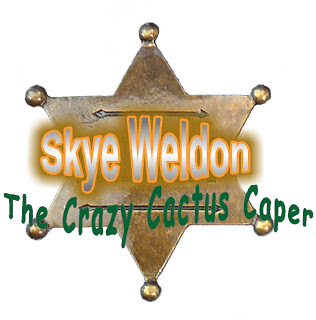 Austin Peachey and company are back with their third audio drama, Skye Weldon in The Crazy Cactus Caper. Once again Austin was able to partner with a few professional actors for this project. This production is a spoof on an Old Time Radio western adventure in the style of Gunsmoke, The LoneRanger, or The Six Shooter. You don’t have to be familiar with OTR westerns to enjoy Skye Weldon, but if you are it will increase the entertainment value of this 20 minute program. The drama was written and directed by Austin Peachey and I have to say that it was quite entertaining. There were several lines which had me laughing out loud. I found myself reminded of the Adventures In Odyssey episode Over The Airwaves which featured a KYDS Radio skit which was also a western spoof. The story line centers around a famous female sharpshooter, Skye Weldon, and her sidekick, Limpalong “Limpy” Cassidy. Skye and Limpy take on an outlaw gang called The Bad Bandits in this story, although the plot is a bit thin. It seems as though the entire point of the show was the humor and the plot was just thrown in out of necessity, which may have been entirely intentional. The writing is very witty and I think this is where Austin’s ability shines. In keeping with the OTR feel, Austin also includes a commercial at about the halfway point which features the fictitious product “Forever Taffy”. As I mentioned previously, in addition to the amateur actors in this production, the cast also included professional actors Phil Lollar (Adventures in Odyssey) and Frank Montenegro (Jonathan Park). Kevin McCreary and Garrett VandenBerg, two members of The Ceiling Fan Podcast (an audio drama in its own right) were also involved. The amateur actors did a remarkably fine job with these over-the-top, comedic characters. Natasha Peachey took the lead role as Skye with Devon Francis filling the shoes of Limpy. If this program were a serious action/adventure or thriller then it may have been more of a challenge for these actors, but with these cartoon-like characters they performed capably. The western accents were very exaggerated, but that may have been intended. The production quality was adequate. There were minor issues with the quality of some voice tracks and the audio levels in a few scenes. Aside from that, the sound effects were nicely done (I don't believe there were any foley recordings) and the music fit perfectly. The scene transitions were quite good and the whole production flowed well. All in all, I think this is the best offering yet from Austin and Natasha. With each project, the overall quality is improving. I encourage the Peacheys to continue to produce these projects and I look forward to what they may have coming in the future. If you enjoy good, fun, and slightly corny comedy, then you should check out Skye Weldon in The Crazy Cactus Caper. You can listen to it on episode 45 of Austin and Natasha’s podcast, The AIO Blogcast. If you have any responses to my review, please post them in the comments below.